Follow the action on twitter! As part of the 2018 HPC Home Performance Conference & Trade Show, contractors were invited to travel to Washington D.C. and meet with key congressional offices to advocate for funding of residential energy efficiency programs, tax credits for residential retrofits, and other policies that can help advance the home performance industry. After attending three days of outstanding educational sessions, networking, and inspiration at the HPC National Conference, we offered you a chance to put it all into practice! We provided talking points and background materials and took care of the scheduling. We had almost 30 contractors show up ready to tell their story! 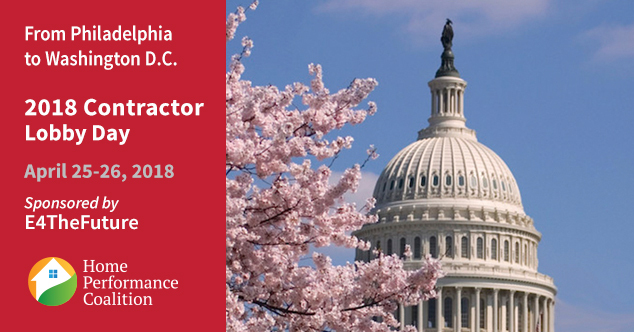 Want to learn more about Contractor Lobby Day 2017? Read more here and check out this picture from #ContractorLobbyDay17!